Example: Circuit Board encapsulated using the PELCO® Epoxy Mount Kit. The clear resin allows for easy identification of the sample. The PELCO® Epoxy Mount Kit uses a cold embedding material designed for metallography, ceramography, geology and petrology samples. Used for light microscopy, scanning electron microscopy and micro probe analysis. It is low viscosity, low exotherm reaction and low shrinkage. It can be used in conjunction with vacuum impregnation to ensure complete and void-free embedding. The cured resin is extremely hard, optically clear, and has excellent bond strength. It gives excellent polish and edge retention to the sample. Polymerization time is 2 hours at 77° F (25° C). Mixing ratio is 2:1 per volume (resin 2 parts to hardener 1 part). The PELCO® 24-Hour Epoxy Mount Kit has the same optical clarity, high hardness, low shrinkage and low viscosity as our 2-Hour epoxy kit, but with a much longer pot life (up to one hour) and slower curing (24 hours). This allows for embedding larger batches in one charge and better impregnation of porous samples.. The longer pot life gives ample time to remove trapped gas and to avoid air bubbles in the embedding. It can be used with vacuum or pressure impregnation to remove trapped gas. The cured resin is extremely hard, optically clear and has excellent bond strength. It gives excellent edge retention during grinding and polishing of metallographic samples. Polymerization time is 24 hours at 77°F (25°C). Mixing ratio is 3:1 per volume (resin 3 parts to hardener 1 part). The pumps screw directly onto the gallon, 1/2 gallon or quart bottles of resin and hardener allowing for quick, exact and clean dispensing. The pumps dispense one fluid once per stroke. An Insert that limits the stroke to 1/2 oz. 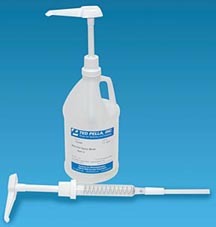 is included to allow for correct ratio of resin to hardener. For example: One pump would be set at full stroke for 1 oz. of resin and the other for 1/2 oz. of hardener. If 3 oz. are required, two strokes of each pump will deliver the correct ratio. 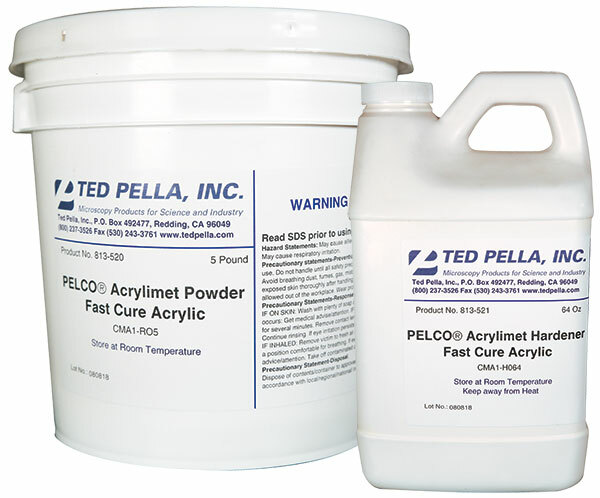 PELCO® Acrylimet for quick turn-around sample embedding using a castable resin system comprising an acrylic powder with liquid solvent/ hardener. 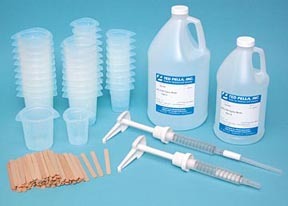 With a room temperature cure time of 5 – 8 minutes following mixing, a cured hardness of approximately 85 Shore D, only moderate shrinkage and being semi-transparent, PELCO® Acrylimet is ideal for quickly embedding electronic components, printed circuit board cross sections and a variety of materials science samples ready for metallographic sample preparation.